I picked up a copy of Jim Gurney's new book a while back, and it has proven to be one of my better book purchases. Had Color and Light been my college Color Theory textbook, I am certain I would be many times more confident with color than I am today. Well, it didn't exist back then, but now that I have read it, I decided I need to give it's lessons a go. The idea behind the gamut is to limit the number of colors you allow yourself, in order to create a strong unity in the piece, and as a safeguard against overwhelming the viewer with too many colors. It also is a quick way to develop a strong mood in the piece. My gamut for this painting is fairly neutral, with the strongest chroma falling somewhere between pure blue and pure cyan. Oh, and I didn't forget about the self-portrait, I just am not at a point with it that I am ready to post anything. Maybe after the weekend. 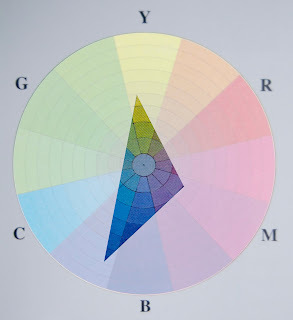 I've been looking for a good color theory book! Thanks for sharing! The palette you chose worked out really well here. I've been meaning to pick up a copy of Gurney's book as well - you're one of the many people to mention how great it is. But then again, if you have the modern day norman rockwell putting out a book, its bound to be amazing. Anyway, the rough looks pretty solid. Are you approaching this more in an alla prima style? Those clouds are looking nice too by the way! Not sure if I am going to go full alla prima, but I do intend to do direct painting. I tend to enjoy it a lot more then glazing, and it is a hell of a lot faster. I still don't have enough brush-control to do a good alla prima, and I want this one to turn out good.